Today was "meet and greet" day. Our location for the first half of the day was the Wal-Mart parking lot. We (Russell and Stephen) got there early (10:45) but not early enough to beat out the two rigs that were here before us! We all were quick to introduce ourselves to one another and so the day got off to a fine start. People arrived throughout the day and came over to introduce themselves and join or not join in the ongoing social hour(s). A brief spell of rain (at one point fairly heavy) did put a damper on the conviviality. The day was spent attending to last minute details such as filling up with gas, shopping for odds and ends and exchanging money. The group bonded some more over dinner at the China Buffet which is a stone's throw from the Home Depot parking lot. The food was plentiful but better still was the conversation. It was early to bed for the group because an early start is planned for the morning. Gary and Judy want us to leave here at 6:45 am so that we can be at the border crossing by 7:00 am. Crossing into Mexico is when our real adventure will begin! It was up bright and early for the group this morning, leaving the Home Depot parking lot before 6:45am in order to arrive at the border crossing by 7:00am. Unfortunately, the group got separated early on but managed to avoid downtown Nogales and lost very little time before reuniting at KM21. KM21 is where one obtains tourist visas and permits for cars/RVs. I've done this paperwork numerous times but I am still not sure I understand the whole process (I suspect some of the hoops one has to jump through have more than little to do with the individual clerk fate provides). Anyhow, the group made it through relatively quickly and with a minimum of angst. It was a beautiful day for driving--warm (low to mid 70s) sunny and dry. Traffic was not too bad, it being a Saturday. We arrived (some earlier than others) at the designated campground around noon. To be fair to those that missed the park on the first go round, the campground doesn't look like much of a campground (the owner has decided to go into the artificial turf/patio carpet business also). The campground is really just a big parking lot with water and electric hook ups. The electricity has been surprisingly good though and mercifully the dogs on the other side of the new solid wall/fence seem to have quit barking for the night. In the afternoon most members of the caravan piled into several tow vehicles and ventured into the town of Hermosillo. They met with limited success in terms of sightseeing but seemed happy enough with the excursion. Social hour was held in front of one of the rigs and the group is well on its way to coming together -- having shared the experience of facing Mexican bureaucracy (and survived) and having successfully passed their first day on the road in Mexico. The group had a nice, leisurely morning featuring a 10am start. As Russell said, "I like any caravan that breaks camp at ten o'clock!" The drive from Hermosillo to San Carlos went much more smoothly than did our drive on day one. No wrong turns, lost sheep or missed exits. The group did especially well driving through Hermosillo -- watching out for the rig behind their own and conscientiously stopping for red lights. Later in the afternoon we had our first fuel stop. No issues there (except for the price!) as the station was quite large and had both diesel and gasoline as well as two attendants. We arrived at Totanaka(sp? )RV Park shortly after noon. The campground was crowded but everyone found a spot to their liking and the rest of the day was spent enjoying the lovely weather (mid 70s and sunny) and getting to know the campground and the area. A quiet day at the campground. More lovely weather enabled everyone to "do their own thing." Whether that was a walk on the beach or into town, a bike ride or doing laundry, today was definitely a day for rest and relaxation. At five o'clock we all gathered together to walk to Charley's Rock restaurant. The restaurant is nearly across the street from the RV park so walking there was no big deal. We arrived at the restaurant in time to watch the sun go down over the rock formations at the end of the bay. Everyone enjoyed a drink before dinner, looking out at the Gulf of California. Later, the group was surprised by the appearance of a local mariachi band. They played for the better portion of an hour and the group so enjoyed their music that several couples were moved to start dancing. It was an enjoyable evening with a definite Mexican flavor. A bit of rough drive today. We were on the road early as planned but unfortunately encountered problems throughout the day including getting separated from our leader and making a couple of bum turns that necessitated U-turns. None of these problems were serious of course in the grander scheme of things (no accidents, injuries, etc.) but it did mean that when we arrived here at Huatabampito we were all ready to get off the road. Fortunately for us the setting of this campground is just marvelous. It's right on the beach, a stone's throw from playful dolphins and scads of feeding birds. Just what you think of when you imagine camping in Mexico. Everyone participated in the "Let's Eat Out" or LEO dinner at the campground restaurant and we all laughed at the travails of the day and passed an enjoyable evening together. Today the sun fought with the clouds for a good portion of the day. It was still warm of course and eventually the sun won out as it so often does here in Mexico. It was a lazy day at the beach for most of us. Some chose to go for long walks on the firm, flat sand while others drove around the area to check out the sights. In the evening we all watched the sunset at social hour and that was followed by a pot luck dinner that was unusually tasty. Chili, jicama and guacamole lent a decidedly Mexican flair to our feast whilst insuring that no one went home hungry. A gorgeous day today! Not a cloud in the sky and low eighties -- marvelous and perfect for yet another beach day. More walks, drives around the area as well as general relaxation -- the perfect preparation for the next several days (sightseeing the Copper Canyon) which promise to be busy ones. We were on the road at 7:30 this morning. The first section of road from the beach to the cuota road (toll highway) was in pretty rough shape resembling more a mine field than a proper street. It was slow going to be sure but we picked up speed and arrived at our destination by noon. The campground at El Fuerte has minimal hook ups (only some of the rigs got 15-amp electrical service while others had no electricity at all). The town of El Fuerte was more impressive than I had expected. It has a real Colonial feel complete with the requisite zocalo featuring a Catholic Church on one side and a municipal building on another. Dinner was a special evening at the Posada de Don Hidalgo. This hotel is reputed to be where the real Zorro was born. There is a statue of him on the premises and our after dinner entertainment featured a Zorro impersonator. Dinner was served on the patio beside the lovely pool after we received a brief tour of the atmospheric grounds. It was a most pleasant evening and not something that I would likely have known about or done were it not for being on a caravan. Today we were up early to board the Copper Canyon train at 8:30. The surprisingly modern and comfortable train was not what I expected, having envisioned something far more rustic. The first class train had a dining car where we had a tasty breakfast and a hamburger lunch. Of course the food and the seats are not the reason one takes the Copper Canyon train; the views are the main attraction and they are lovely. We started the day in a warm, desert climate and finished at 7700 feet with pine trees and freezing temps. In between we ran through many tunnels, over bridges, along creeks, past lakes, seeing blooming trees of yellow and pink. It was truly a memorable experience. Memorable too was the entertainment after tonight's dinner at the hotel. It featured a trio of singing and guitar-playing caballeros who did rousing renditions of Latin favorites and even some English classics (?) such as "I've Been Working on the Railroad"! Today we explored the Creel area after a delicious breakfast. Our bus tour began with a visit to a native family that lives in a traditional cave home. The family very graciously allowed us to see their surprisingly homey and warm sleeping quarters and we got to see their outdoor living space as well. Although most people would consider this family (like most of the people we met today) extremely poor I am not sure they would describe themselves in that way. Next we visited a scenic lake, some rock formations, a boarding school for native children as well as a Jesuit mission. It was good to see that the government has made some effort (in the form of the boarding school, a clinic and housing) to improve the life of the Tarahumara natives. Unfortunately there still exists too many mothers and children selling trinkets on the street and one suspects barely scraping by. Our interesting tour concluded with a lunch served al fresco. The "cowboy" lunch was all set up when we arrived. The food was tasty, the conversation interesting but the wind did put a bit of a damper on the festivities. In the afternoon we were free to explore Creel, to nap or even to explore the Internet with the free WiFi provided at the hotel. Dinner was more subdued than the previous night as some of our fellow guests had departed the hotel and there was no entertainment. The food was still of high quality and the service improved with the fewer number of diners. After an "energizing" (the word used to describe this morning's meal in the promotional material for the trip that we were provided with) meal, it was back on the bus at 9:00am for our ride from Creel to Divisidaro. The landscape was very southern Rocky Mountains -- pine trees, exposed rock, dried grass, etc. The road was not too bad. We stopped several times to see rock formations and for views of the Copper Canyon. The highlight of the day was our mid-day stop at a place where half the group went zip-lining and half the group took a round trip gondola ride instead. The portion of the canyon where we were at was quite spectacular and the views from the gondola as well as from zip lining (I imagine) were memorable. Again, it was nice to see the government sponsoring this adventure travel facility that featured mountain biking and rappelling as well as the zip lines. A late lunch was enjoyed at our hotel, the Hotel del Castle and yes, it is in the shape of a castle. The proprietress whose English was quite good could not have been more pleasant or accommodating though the rooms complete with stone walls were a bit on the chilly side. I think everyone is ready for a return to warmer weather! Note from Company: We have to emphasize that Copper Canyon is high alttiude and customers on our Spring Caravans need to be prepared for some chilly temperatures, especially at night. This is also true of Durango, and to a lessor extent Zacatecas. The one hotel we use at Copper Canyon does have a hot tub so ensure you bring a bathing suit, along with warm clothing. This is not so much the case on our Fall caravans which visit Copper Canyon in late October, although there is a higher risk of rain at that time. 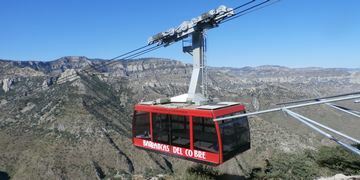 Unfortunately timing with other events on our Spring caravans precludes doing Copper Canyon on the return trip. The one advantage is that it is less crowded and we avoid clashing with some of the large French Canadian Caravans who visit it in March..
After breakfast this morning most of the group elected to go for a hike. Despite chilly temps and a stiff wind our intrepid hikers enjoyed gorgeous views of the canyon up close. We checked out of our hotel at 12:00 and after a brief bus ride we settled into a new hotel lobby. This one featured a fine view of the canyon, a fireplace, bar and even bird life. We also stopped for a brief but educational visit to some petroglyphs. Along the way we received some information on the native's use of local plants. After our boat trip we took a brief break before heading out on another informative tour this time of the downtown area. Our guide -- Zorro from our dinner at the hotel -- was exceptional. We stopped at the fort, the municipal building, the square and the church. After our city tour we had free time in the afternoon for laundry, naps and phone calls home. Dinner was delicious tacos at the family-run food stand across the street from the park. After a long (7:00am to 3:00pm), not completely error-free day of driving the group arrived at Mazatlán. The weather (upper eighties) and full services (electric, sewer and water) were gratefully received. Management Note: For those contemplating a future caravan worried about "errors", please be aware that no Caravan is ever "error free". Errors usually mean somebody taking a wrong turn. This is why we insist on everybody having a cell phone. Holding together a large group of RV's is taxing even in Canada & the US (speaking from experience as a wagon master there), let alone in Mexico. However, we are always ready to deal with any situation. So far we have only ever had minor bumps and plan to keep it that way. A day for chores under the blue sky. Laundry, phone calls, Internet, "making water", shopping, etc. It felt good to take it easy and catch up on the essentials. Our campground here is a bit out of town but only a block or two from the beach. The front area is crowded but where they placed us - in the back - is not crowded at all and the group is pretty much by itself. Best of all there is reliable 30 amp electrical service! A real luxury here in Mexico. Another beautiful day for relaxation. Sunny and in the low to mid 80's, caravaners found various ways to amuse themselves today. Some took long walks, others went for a swim. Some went downtown to the market. A few scored good buys on locally produced, hand-made rugs while others went to Fat Fish (specializes in ribs! go figure) for dinner. A most enjoyable day, no matter how one chose to spend it. After an unanticipated extension to our stay in Mazatlan owing to SNOW and mud/ rock slides, the caravan was able once again to hit the road today. Our destination? Durango via the mostly brand new (but costly) Durango-Mazatlan Highway. This is a very scenic road that threads its way through the Sierra Madre mountains. At one point on the road we were at over 8,000 ft in altitude and there was, as you may have guessed, still snow on the ground. It was fun to see the Mexicans enjoying the snow -- throwing snowballs, posing for pictures and even picnicking! The last thirty miles of our highway were in poor shape and the scenery far less spectacular. Speaking of not so spectacular, tonight's camping site is a barren lot behind the Holiday Inn. Of course it could be worse (it can always be worse) since the traffic noise is somewhat muffled and it seems an inconspicuous and therefore relatively safe spot for one night's stay. Management Note: Durango currently has no RV Park, so that leaves us with limited choices, Gas Station, Fair Grounds or a Hotel Parking lot. In the Fall we used the parking lot of a "No-Tell Motel". While this provided entertainment for some of our customers, especially those who got a room and discovered Channel 8, we felt that it may offend some, so we have gone to the more sedate Holiday Inn. As for the delay, that was totally unexpected. We expect this sort of thing on Fall caravans which start at the tail end of the rainy season, but not in the middle of the dry season. This is, however, an El Niño year which may account for it. However we recovered well. We do build in a few days leeway so we can adjust schedules to account for this sort of thing, but no Wagon Master likes it when this happens. In this case we had to cancel 2 tours in Durango, but we will make up for those later on in the trip. On Saturday (the 7th), the group visited the Corona Brewery. It was a long wait for a brief but interesting tour. The amount of beer produced at this facility is truly staggering. Sunday was spent exploring some archeological ruins in the countryside around Zacatecas. The weather was perfect for the somewhat challenging walk up to the ruins which were located at the top of a tall hill/small mountain. The rock work was most impressive and the fact that they have only uncovered 1% of the site was surprising given the extent of the visible ruins. After a lovely lunch at a woman's house where we dined on meat and lots of it, we were off to Jerez. This out of the way town was positively hopping with activity. Bands were playing in the zocola, generations were mingling and most were in their in their Sunday best. It was Mexico at its finest! Today's drive got off to a bit of rough start but we recovered quickly and navigated through several large towns/small cities without incident. Yeah for us! The drive, while only 327 kms, took 8 1/2 hours! Poor roads, a military check point where they decided to search several vehicles and plenty of tolls made for some slow going. We got to the campground at three thirty and were treated to full hookups as well as a lovely (and picante!) Mexican dinner of flautas, quesadillas and tacos. Management Note: Wow, this trip only took 5 hours in Fall. Today was a difficult day travel-wise. Not that the roads were any different than usual but the group got separated not once but twice. No mechanical problems or traffic accidents thankfully so it definitely could have been worse! Our "campground" is a field with no hookups at the end of a bumpy road which runs right through the center of a town full of curious/amused citizens. On Valentine's Day the group was treated to a special "spa" day. The spa consisted of a series of rooms with modestly sized concrete tubs that were filled with hot water fresh from the earth. After enjoying a soak, each couple was treated to a massage. At night there were more surprises! Hamburgers and pizza with a view! It was a Valentine's Day that will long be remembered.